Hello, everyone! 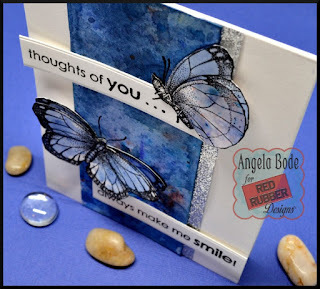 It's my turn to share a project featuring fabulous Red Rubber Designs stamps! 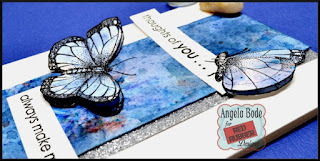 Today I am showcasing the sensational butterflies from the Flutter By unmounted rubber stamp set and a fabulous sentiment from Caring Cards 1 cling mount stamp . I created a background layer using Ultra Marine and a dash of Black Brusho Crystal Colors on mixed media paper by repeatedly swishing and tapping the paper in the watery ink. The butterflies were stamped two times each and swished through the ink once to add contrast to the background. The butterflies were fussy cut and layered for added dimension. 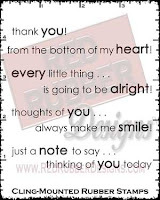 The sentiments in Caring Cards 1 are single sentence stamps making them super easy to work with. I love that I was able to separate the sentiment on this card without having to mask the second part of the sentiment and cut it apart! I chose this particular sentiment because I am going to give the card to a new friend I met at our local park. We struck up a conversation a couple of weeks ago while we were on the same path and we have been walking partners ever since! When I think of her I most definitely smile! This is so beautifully done, the wings are fabulous on the butterflies. Oh, Angie what a beautiful background you've made, and I LOVE these butterflies. I love how you've popped them and added both of their wings! Beautiful layout, and I love the added glitter piece! Stunning, sweet friend!! Hugs, and enjoy the weekend! I love a dimensional card! Those butterflies are just perfect and that blue background is just so pretty!